An in-depth and global look at the growing phenomenon of failure to launch young people who return home and what this means for family structures and the economy. Acclaimed sociologist Katherine Newman explores the trend toward a rising number of “accordion families,” composed of adult children who will be living off their parents’ retirement savings with little means of their own when the older generation is gone. 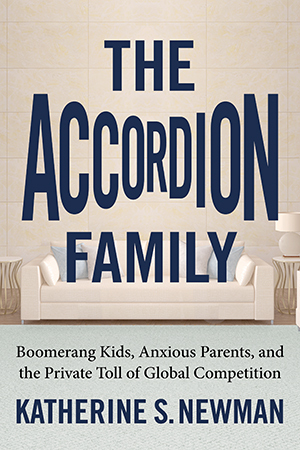 Her investigation, conducted in six countries, transports the reader into the homes of accordion families and uncovers fascinating links between globalization and the failure-to-launch trend. In this gripping and urgent book, Newman urges Americans not to simply dismiss the boomerang generation but, rather, to strategize how we can help the younger generation make its own place in the world. It is no laughing matter in Italy, particularly in government circles where the economic consequences are adding up. Prime Minister Silvio Berlusconi came out in support of the campaign against mammismo, having been elected on the promise of doing away with “that hide- bound aspects of Italian life which inhibit dynamism and growth.’ ““ In January 2010, Italian cabinet minister Renato Brunetta proposed making it illegal for anyone over eighteen to live with his or her parents. He made the suggestion on a radio show where he also admitted that his mother made his bed until he was thirty, when he left home. She doesn’t really need the money. What she needs is to know that her son is going to grow up and assume the life of an adult. That metamorphosis was unavoidable in Kumi’s day. The post¬±World War II period in which she came of age was a time of widespread poverty and hardship in Japan. The boom years that followed were a blessed relief, but one that exacted an enormous commitment in work hours, particularly of Kumi’s husband. Discipline, dedication, willingness to spend virtually every waking hour at the office--these are the qualities she associates with manhood.